Carnitas are perfect weekend food. Festive and fun to eat, they are great for a casual party or a large family gathering. Begin the meat early in the day so that it will slow cook in the oven while you go about your daily business. As the meat breaks down, it will be infused by the beer and chipotle braising liquid until it’s falling apart tender at the bone. A little shredding and a final turn in the oven with the reduced sauce turns out smoky, spicy, caramelized pork, ready to pile on tortillas with salsa and guacamole. If you have any leftovers, the meat may be used in sandwiches or loaded on homemade nachos the next day. Heat oven to 300 F. Mix the cumin, paprika, sugar salt and pepper in a small bowl. Rub the spices all over the meat. Heat 1 tablespoon oil in a dutch oven. Brown the pork on all sides. Remove the pork. Add onion, garlic, beer, orange juice, chipotles, lime juice and brown sugar to the dutch oven. Bring to a boil, scraping up any brown bits, then reduce heat to a simmer. Return the pork to the pot. Cover and transfer to oven. Cook until pork is very tender, about 3 to 4 hours, turning every hour or so. Remove pork from the braising liquid and transfer to a cutting board to cool slightly. When cool enough to handle, shred the meat. Place the meat in a baking dish. Strain the braising sauce into a saucepan. Boil until reduced to a sauce consistency. Drizzle over the shredded pork. Transfer the pork to oven and broil until the meat begins to caramelize, 3 to 5 minutes. To serve, spoon some of the pork in the center of a tortilla. Top with guacamole, salsa, fresh cilantro and scallions. Roll up and eat. I have been cooking with more and more pork shoulder – the tenderloins and chops just seem to dry and lack flavor. These look tempting. Oh I love carnitas, and usually make Diane Kennedy’s recipe. But I would love yours with the spices, orange and beer flavors. To die for. Next time I eat pork, this is at the top of my list. This sounds fascinating and am certain will taste almost as good even if made with Australian beer 😉 ! We have a favorite spot here in town where Carnitas can be bought by the pound, but they are the traditional deep fried kind. Making them at home on a lazy weekend day without the added fat is a much better idea! the taco photo is scrumptious! Lynda, this looks so pretty. I have never been able to photo tacos in a way I”m happy. I love the recipe with Mexican beer too. This is so up my alley. Wonderful spices, wonderful photo! Just looking at your great photo makes me hungry. 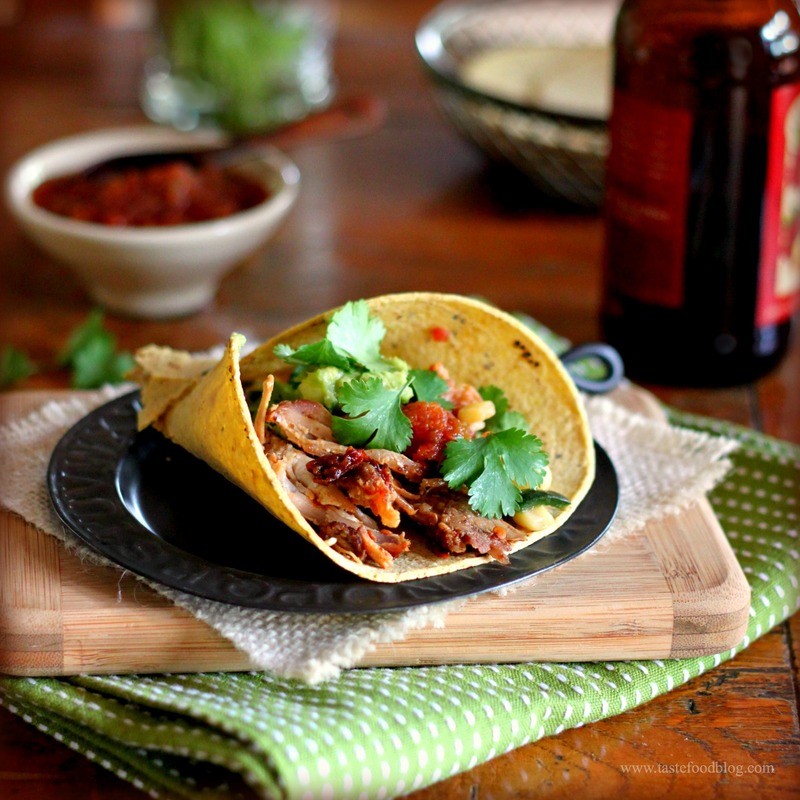 Carnitas could be the perfect food….really. Insanely delicious… broiling at the end for that extra crunch is such a great idea! I had been searching for a homemade carnitas recipe for a while, and decided that yours looked the best. I gave it a try for my wife and three kids (ages 7, 7, and 6) this weekend. I special ordered the pork shoulder from my grocer, but wasn’t able to find chipotles in adobe sauce, so I had to make a few adjustments — I instead included 1/2 tsp of ground chipotle powder in my dry rub, and I put all of the rub that didn’t go onto the pork into my braising liquid. I would have used more chipotle powder, but what I have is fairly hot and my kids are sensitive to too much heat. I also threw in a few bay leaves and about 1 tsp of crushed juniper berries into the braising liquid. I had never cooked a pork shoulder before, so I decided to leave the fat cap on while cooking (rather than trimming it beforehand). After braising the pork for four hours, I removed from the dutch oven and allowed it to cool for about 90 minutes, and then pulled it by hand, discarding any large chunks of fat. I strained and simmered the braising liquid, skimming off much of the fat that came to the top. I probably over-reduced mine, as I let it simmer for about an hour while I made tortillas. After making the tortillas, I tossed the pulled pork in the remaining liquid, and broiled in the oven for about seven minutes to crisp it up. The recipe was great and a big hit in my house. Next time, though, I think I will make a couple of alterations. First, while I am a beer drinker, I felt like the pork came out a bit dry tasting — I wanted a bit more tang. I think I would add a bit more acid, either via more lime juice or with vinegar, and I would consider substituting something else for the beer (I used Pacifico) — I had been considering going with a hard cider, but chicken stock and a splash of vinegar might work, or perhaps a bit of margarita. Second, while I personally liked crisping the pork, I think it was probably lost on my family. I will be tempted to use the braising liquid without reducing and to skip the broiling step, especially since it meant a second dish to clean by hand. All in all, though, this was a great carnitas recipe and I highly recommend it to anyone looking for a tasty meal! Thanks!